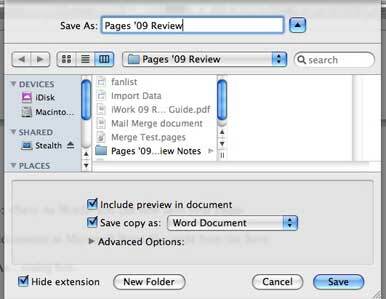 The introduction of Pages ’09 marks the fourth release of iWork’s handy word processing and page layout application. Each new release of the program has featured major improvements to Pages’ word processing tools, capable page-layout features, and beautifully designed interface. Unfortunately, each previous release was also marred by missing or poorly implemented features or tools that didn’t quite live up to their potential. I’m very happy to say that with Pages ’09 Apple has hit a sweet spot: it added necessary features, enhanced existing tools, fixed minor annoyances, and gave users exactly what they asked for, although there are still some minor issues Apple needs to address in order the make the program perfect. Pages’ past shortcomings have been mostly related to business, science, and academia. Pages’ mail merge features were abysmal, updating a Numbers ( ) chart inserted into a Pages document was complex, and users working in scientific and academic settings found that creating footnotes, bibliographical reference listings, and sophisticated mathematical equations was difficult. Apple has addressed all of these issues in Pages ’09. Pages now lets you to use a Numbers spreadsheet as the source database for a mail merge. The process is straightforward; you have to prep your spreadsheet before it’s ready for a merge. To test this, I used Numbers to open an existing Excel ( ) spreadsheet with over 1,000 records. To prep the spreadsheet, all you need to do is select the row you want to use for header data—name, address, and so forth. After that, a very small arrow appears next to the cell number. Clicking that arrow opens a menu from which you can select the Convert To Header Row option. Once you’ve done this, saving the spreadsheet makes it ready for Pages to use as merge data. But this wasn’t obvious at first. In fact, when I initially attempted to select the Numbers spreadsheet as my merge source I got a cryptic error message about the header row that was not at all helpful. But once I managed to fix the header row, merging data in Pages worked as expected. I added fields from the spreadsheet to my document, including personal information stored in the Address Book such as my name, home address, and e-mail address, and the data merged with ease. While I’m thrilled that users can now merge data from other sources to a Pages document, there are still elements of Pages’ merge feature I’d like to see changed, or at least enhanced. First, short of completing an entire merge, there is no way to preview the merge data in your document. I’d love for Pages to provide some means of previewing the data without first requiring you to merge the entire document. Pages' new Full Screen mode lets you easily work with two pages of content at once, revealing menus and tools only as you need them. Second, it would be easier if Pages could give you an option to use the first row of your spreadsheet as the header information. While creating header columns wasn’t a total hassle, the intermediary step was initially confusing, and I ended up having to figure out how to create a Numbers header column before I could even select the file as a data source. Finally, there was a small bug when I attempted to merge an e-mail address from the spreadsheet. After the merge, not only did the e-mail address appear, but there was additional text—mailto:emailaddress@emailaddress.com—in front of the merged address. Apple acknowledged this bug and says that it will be corrected in a future update. One of my complaints about Pages ’08 was that it wasn’t possible to update a Numbers chart inserted into Pages documents when the chart data changed. This too has been fixed in Pages ’09. You insert a Numbers chart into a Pages document by copying the chart from Numbers and pasting it into your Pages document. Clicking the embedded chart in Pages reveals a small black pointer containing a small sync button. Click the sync button and—if the chart data was changed and saved in Numbers—the chart in Pages will reflect the updated information. The pointer can also be expanded to reveal a hyperlink to the original Numbers spreadsheet and a button to completely unlink the chart data. It’s now very easy to update changes to charts that you created in Numbers and embedded in Pages documents. You can also make changes to the way charts appear in your document, giving them a 3-D look, for example, without affecting the original Numbers chart. My only disappointment with the chart-linking feature is that there’s no way to globally update all the charts in a document at once. 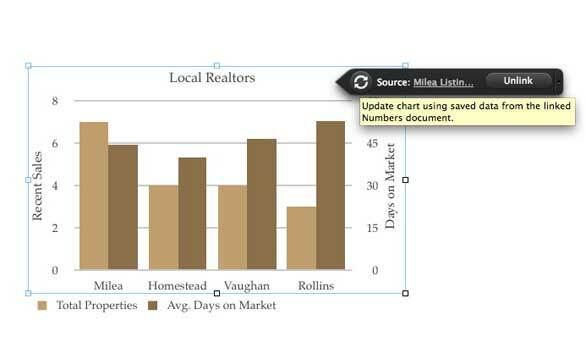 So if there are many embedded charts in your Pages document, that potentially means many clicks to update chart data. Pages ’09 has added integration with two programs to round out features that were necessary, but missing in earlier versions. Install MathType and EndNote X2 on your Mac and three new items will appear in Pages’ Insert menu: one for adding an EndNote citation; another for working with an EndNote bibliography; and a third for inserting a MathType equation to your document. Another EndNote-related item is added to the Edit menu for changing the citation format and managing your EndNote citations. Double-clicking an embedded citation or equation launches the associated program, from which you can edit and save your entries. The changes will then be reflected in your document. Unfortunately EndNote has a hefty price tag ($250 for the download; $300 boxed): At more than three times the price of the iWork package, that may leave some potential Microsoft Word ( ) switchers cold, especially since Word has some reasonably good bibliographic tools built in. MathType is less expensive (about $95) and it is also significantly better than Office’s built-in equation editor. One of my favorite new Pages features is the program’s Full Screen mode, which reduces your entire world down to one or two pages of text. Menus, page thumbnails, scroll bars, and even an Inspector palette can be revealed with no more than a flick of the mouse to the left, right, or top of your screen (opening the Inspector requires a menu selection), but as soon as you move the cursor away you’re back to the business of getting your work done, distraction free. You can now save your Pages documents as Microsoft Word files right from the Save As... dialog box. Further, Full Screen mode offers a two-page view that works great for word processing, but is especially good when you’re working in page layout mode. Even on a 13-inch MacBook, I found the work area to be spacious. 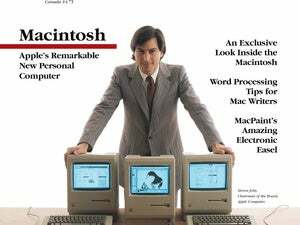 In fact, the only complaints I have with Pages’ Full Screen mode are the inability to change word processing documents to green text on a black background—yes, a throwback to the Apple II—and the fact that there’s no visual indication as to whether your document is saved or not. But these are all minor issues in what is otherwise an excellent new feature. 1. No combined package files. The default Pages document is now a single file (like a Word .doc file) that can be easily sent to anyone via e-mail or uploaded via a Web browser. 2. Save as... Word. You’re no longer required to use the Export option to save a Pages document in Word format. 3. Live word counts. It’s no longer necessary to have the Inspector open just to see how many words you’ve typed. And clicking the number at the bottom of the document opens the document Info inspector so you can see other details. Pages still doesn’t warn you if you open a document that someone else is working on, but at least now it will alert you if you’re about to save your edits over changes that someone else has made. 4. Outline mode. While it may not replace programs such as OmniOutliner ( ), Pages’ outline mode lets you easily outline a quick and dirty brainstorming session, which can then be used as the starting point for a new word processing document. 5. Track changes works on objects. In addition to text, Pages can now track changes made to images, tables, and other objects. 6. Support for multi-touch gestures on your laptop. There are also new templates, an Open Recent button in the newly redesigned template chooser, and a new Share menu that makes it much easier to send Pages, Word, or PDF documents via e-mail. I reported a curious bug in the previous version of Pages: If you had a document stored on a network or if you were sharing an iWork document on your computer, it was possible for two people to open and edit that document at the same time. You weren’t warned that someone else was using the document nor were you forced to open the document in a read-only format. Thus, it was possible to overwrite someone else’s work—or someone else to save over yours. Pages still doesn’t warn you if you open a document that someone else is working on, but it now will alert you if you’re about to save your edits over changes that someone else has saved. This isn’t perfect; it’s better to have the choice not to work on the same document as someone else, but I’m relieved that you can no longer accidentally overwrite someone else’s work. 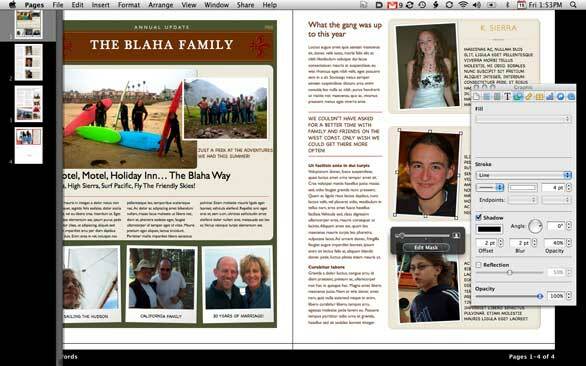 With the exception of a few pesky flaws, Pages ’09 is an excellent update to what was already a good, but limited word processing and consumer-oriented page layout program. The addition of more robust mail merge capabilities, better integration with Numbers charts and tables, the introduction of integrated equation editing and footnote support via third-party apps, and features like Full Screen Mode, elevate Pages from a boutique application for a few iconoclasts, to a business-ready word processing application for anyone and everyone.